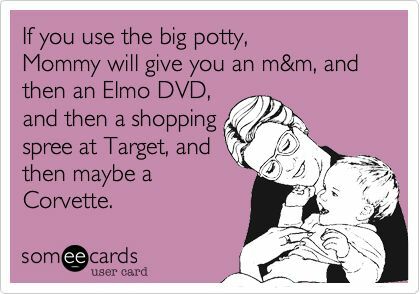 Three Gals and a Guy : Why You Don't Need to Potty Train Your Kid- No, really you don't have to!! 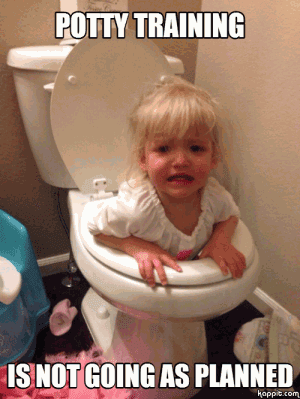 Why You Don't Need to Potty Train Your Kid- No, really you don't have to!! The topic of potty training is dominating the Scholtes house lately. Having an almost 2.5 year old, 5 year old and new puppy- a common phrase heard in our house are, "do you have to go potty?" Since Saidey turned two- I've been gently encouraging her to try to use the potty and motivate her with Dora and Minnie Mouse undies. Think she gave two rips? If you said "no" you would be 100% absolutely correct! She showed some interest in sitting on the potty in the beginning but then the novelty wore off. I would ask her at each diaper change if she'd like to sit on the potty and she all but clawed my eyes out on the way out the door, running away from me. I took that as a sign and backed off (a little). The times I gently er forced her to sit- she cried and cried. So I backed off. I offered and if she said no- it was done. No more trying to persuade or bribe. Although- we did bribe by saying if you sit, you'll get a treat. WM even tried offering to buy her a toy at Target. I'm not even sorry- we are not above bribing. But again, no dice. Well, all this week after her diaper change when we bring her home after daycare- she hasn't wanted to put her diaper back on. So we busted out Dora and Minnie again and all this week- not only has she stayed dry but she has said, "potty," and we've run to the bathroom and she's gone. AND if I ask her, she WILLINGLY goes. Without tears or me chasing her around trying to get her to sit on the potty. So, you see- the common advice- WAIT UNTIL THEY'RE READY- it's true. Really, I promise you! If you wait until they're TRULY ready and follow THEIR lead- I promise you there won't be very much training involved at all! I know this is only shy of a week but we've gone all week (during the evening hours) with no accidents and success going #1 and #2 in the potty all by herself. When they're ready- THEN bust out all those tricks to keep that momentum going but if they're truly ready- you most likely won't have to use all those tricks up your sleeve we've all been told to use. This weekend is tax free in Iowa so we're headed to Target to get stocked up on school supplies and then heading to Tanger Outlets for a little shopping for back to school clothes and maybe a little something extra for myself :). Happy Friday, all! HAPPY POTTY TRAINING!